Fuel Card Services is pleased to announce we will be in attendance at this year's upcoming Fleet Operator Recognition Scheme (FORS) Nationwide Practitioner Workshops. Set to be held on Wednesday, March 9th in London, the workshop is entitled 'Reducing Fuel Use and Minimising Environmental Impacts' and will promote best practice among UK fleet operators in terms of maximising their green credentials. Special thanks have been reserved for Rachel Pearson, who has spent more than a year working in partnership with FORS to set up the new event and who will be in attendance at next month's workshop. Members of FORS are also reminded they can receive discounted services when signing up for Fuel Card Services products. 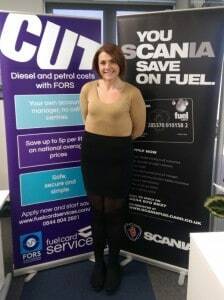 Rachel, who is the dedicated account manager for FORS members, commented: "There are many small changes fleet operators can make which can not only reduce their environmental impact, but also reduce their fuel bills too." The importance of monitoring and measuring KPIs. Upcoming policies that will help to minimise the environmental impact of the logistics sector. Present environmental issues being faced by UK logistics operators. Driver training discussions, including how to maximise fuel efficiency, anti-idling and aerodynamics.